Did you know? The design of the "Bolshoy" Ice Dome is based on the image of a frozen droplet and will be principally silver once complete. Events: Ice hockey and Paralympic ice sledge hockey competitions. Did you know? Shayba translates to 'hockey puck' in Russian and the arena is mobile meaning that it'll be used for other Post-Olympic competitions all over Russia. Events: Will be used to award Olympic Medals. Did you know? The medal winners will be permanently recorded on the steps of the Plaza. Thirteen hundred medals will be awarded at Sochi 2014, each weighing between 460 and 531 grams. Events: Figure skating and short track speed skating. Did you know? The venue is portable and will be relocated to another Russian city to be transformed into a skating training facility after the Olympics. Did you know? Speed skating has always featured on the Olympic programme, making its debut in 1924 at the first Winter Games in Chamonix. Women were permitted to compete at the 1960 Games in Squaw Valley in four events with that rising to five in 1988 and then six in Turin eight years ago. Did you know? Curling has been an Olympic sport since 1998. It was founded by the Scots in 1541. Did you know? The second-largest housing area, the 47-building Usadba Coastal Village, will host approximately 3,000 athletes and delegates including those competing in ice hockey, curling, figure skating, speed skating and short track events. Did you know? Laura is a turbulent mountain river with a large number of waterfalls. The name of the river is based on the legend of a young girl called Laura who chose death over living with an old prince she did not love. Did you know? The Jumping Centre includes two Olympic jumps of 312 ft and 410 ft for both male and female ski jumpers. This is the first year that women have been able to compete in this event. Did you know? State-of-the-art ice preparation technology ensures optimum temperature control along the entire length of the track. The word "Sanki" means harmonious in most languages. Did you know? The total length of the competition track is 20km. All the slopes were developed by Bernhard Russi, a world-renowned ski slope architect from the International Ski Federation (FIS). After qualifying, crowd-funding doge, Reddit and virtual currency have combined to raise approx. $93,000 to help the two man Jamaican Bobsleigh Team afford essential equipment and training costs essential for competing at Sochi 2014. Since Russia won the Winter Olympic bid, the resort of Krasnaya Polyana has grown approx. 10x in size. The resort is now dubbed the 'Billion Dollar Ski Resort'. Situated 40km inland from the black sea, it's one of the most expensive places to ski in the whole of Russia. Adler is a popular holiday resort, situated on Russia's Black Sea coast line. Although Adler is part of Sochi, it is actually 22km south of Sochi's city centre. Among the natural wonders of the district is the Akhshtyr Gorge with a 160-meter-long cave which contains traces of human habitation about 30,000 years ago. The original airfield was constructed to protect Russia's Black Sea coast during World War II. Huge renovations have taken place for the Sochi 2014 Winter Olympics. 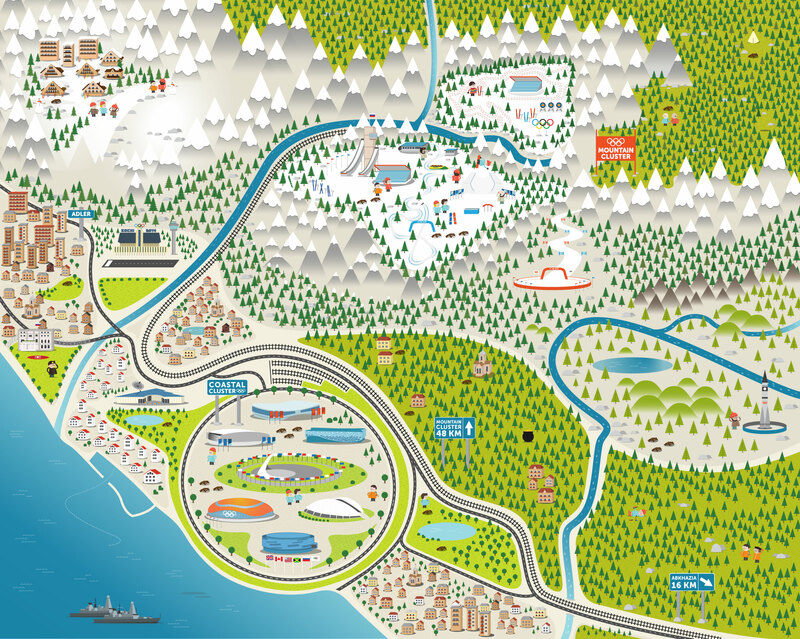 Sochi airport accommodates 32 airlines and fly's to over 73 destinations worldwide. The BBC promises "the most complete digital coverage of a Winter Olympic Games to date". It will cover over 200 hours of network TV coverage, including 650 hours of live action via six HD streams. The cost of covering the Games is expected to be a third of the £66 million the BBC spent covering the London event. In June 2013, Russia passed a law banning the promotion of "non-traditional" sexuality to under-18s - widely seen as an attack on gay rights. The Mayor of Sochi has stated he does not want any Gay Olympians to act "inappropriately" in Sochi. Constructed in 2005 for an estimated $1 billion, Putins Palace is located on the Black Sea coast, North of Sochi. It's said to be one of Mr Putin's "favourite places". The exact location of the palace is not marked on maps for security reasons. Russian military have unveiled the world's first underwater machine gun just in time for Sochi 2014. It not only works under water but also on land, oh and it is also equipped with a grenade launcher. It has been named the ADS 5.45mm automatic. New transport links (rail and motorway) from the coast to the mountains cost approx. $8.7 billion, more expensive than the total cost of 2010 Vancouver Winter Olympic Games. Russian Esquire magazine estimated that, for that sum, the road could have been covered with a 1cm-deep coating of caviar. The Olympic torch boldly went where no torch has gone before - into space. Two Russian cosmonauts took the Olympic torch to the International Space Station and went on a space walk. The Norwegian cross-country skier Bjorn Daehile is the most decorated Winter Olympian of all time with 8 gold and 4 silver medals. Sochi hosts, a Water Park, an Oceanarium, a Light House and two (very discrete) gay bars. The cost of building new facilities and transport routes has been reported to reach an unprecedented $51 billion. That makes the Sochi Winter Olympics the most expensive Olympics ever and more costly than the last 21 Winter Games combined. Sochi is also bordered by the disputed territory of Abkhazia, less than 10 miles to the south, which has seen extremist violence since the disintegration of the Soviet Union in 1991. The US military have positioned two naval ships in the Black Se	a to support Russia in any possible terrorist attacks on the games. How much do you know about the 2014 Winter Olympics? The highly anticipated Winter Olympics in Sochi is about to begin but aside from the controversy surrounding gay rights, what else do you know about the Games? Take a tour around our interactive map to discover the brilliant and often bizarre facts about the Games - trust us, you couldn't make some of this stuff up! This site is designed for desktop screens only. Why not take a look with a larger screen?